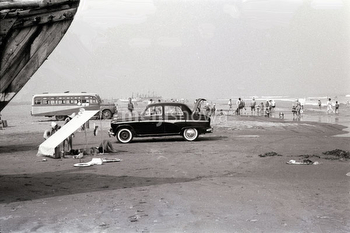 People relax next to an Austin A50 Cambridge Saloon on a beach near Shimoda, Shizuoka Prefecture, ca 1960 (Showa 35). In the back a bonnet bus (ボンネットバス) can be seen. The A50 Cambridge Saloon was the result of a collaboration between the Austin company and Nissan, and was manufactured from 1954 (Showa 29) through 1958 (Showa 33). In total, 20,855 licensed Austin vehicles were produced by Nissan in Japan.